Dr. Monica Miller is one of 18 faculty members from institutions of higher education across Georgia selected as a 2018 Governor's Teaching Fellow. Full Name: Dr. Monica Carol Miller. Title: Assistant Professor of English. Degrees: Bachelor’s and master’s degrees in English from the University of Tennessee-Knoxville; doctorate in English (with a minor in women’s and gender studies) from Louisiana State University. "Helping create MGA’s first Summer Scholars Program this past summer for incoming students was one of the most rewarding experiences I’ve had teaching. Drawing on scholar Mab Segrest’s theme of the 'Georgia Surreal,' the Summer Scholars Program provided an intensive living/learning community for new MGA students on both the Macon and Cochran campuses. The program was a kind of 'study abroad in Georgia,' as we went on weekly field trips around the region and tooka final service learning trip to Savannah. I think it makes a difference to be able to see where Flannery O’Connor wrote her stories, to be able to see the hayloft she set 'Good Country People' in, or what the woods looked like in 'A Good Man is Hard to Find.' By touring a variety of places - from cemeteries to museums - we spent a lot of time talking, thinking, and writing about what we should learn from the past and how we should commemorate it. "This experience cemented my commitment to experiential learning, which I continue to use in my classes. This semester, I’m especially excited about the work my students are doing with the Harriet Tubman Museum in Macon. Both my first year composition students and my advanced professional writing students are researching aspects of the museum, from their exhibits to their accessibility. Students in my 'Professional Writing 4660' class met with the director of the museum to learn more about the challenges they’re facing; these students are now researching possible solutions for these challenges, including possible sources of funding these solutions. These students are gaining real-world experience in research, report-writing, and grant-writing. Not only does this give them a solid advantage on the job market, but it hopefully makes their classwork more engaging, as they’re able to see real stakes in the work they’re doing." What attracted you to a faculty position at Middle Georgia State University? "I was happy to join Middle Georgia State University at a time of such growth! 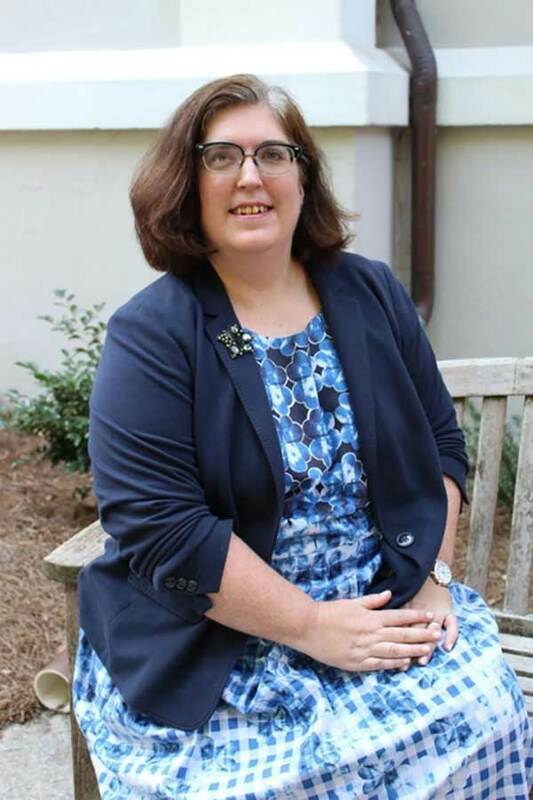 I started teaching in the English department just as they began an undergraduate minor in professional writing and a graduate certificate in technical writing and digital communication, and it has been a rewarding experience, being part of this growing program." What do you like best about teaching at Middle Georgia State? "I appreciate working in an engaging, supportive atmosphere with colleagues who are dedicated to creating enriching learning environments. I especially enjoy the opportunities for collaboration, such as working with other faculty, staff, and administration members to create the Summer Scholars Program and working with community partners such as the Tubman Museum and the Washington Memorial Library to create experiential learning projects for students." "Students need ample time and quiet to focus deeply on reading and writing. This is necessary for any student, but especially for English majors and professional writing students--they need to be able to dive deeply into what they’re reading with a critical and analytical focus, and not just surface read while doing something else. And the only way to produce strong writing is to take the time to rewrite, rewrite, and rewrite!" "How much I love to dance! From the time I won a disco contest at the age of five until now, any kind of dancing makes me happy. Every Sunday afternoon, in fact, you can find me at Zumba class."